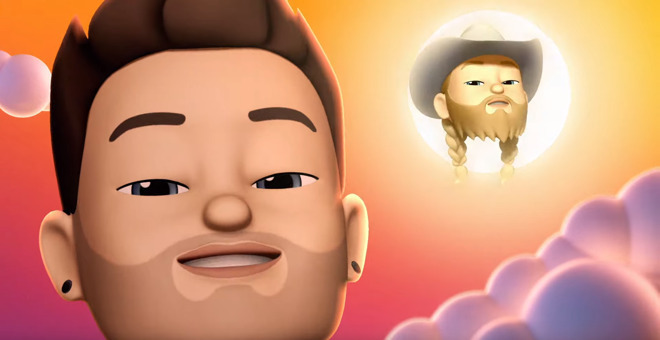 Expanding beyond a recent billboard campaign, Apple on Friday released a trio of Apple Music ads ahead of this Sunday's Grammy Awards, themed around the memoji feature on the latest iPhones. The ads feature the Khalid song "Talk," Ariana Grande's "7 Rings," and Florida Georgia Line's "Simple," respectively. The last one is notable in that Apple rarely promotes country music outside the boundaries of Apple Music and iTunes, and even there to a lesser extent than pop, rap, hip-hop, or R&B. All three acts are current or previous Grammy nominees. Earlier this month Apple debuted billboards specifically based around this year's crop, erecting them in Los Angeles, where the Grammy ceremony is taking place. Memojis -- customizable animojis -- have become a common touchpoint in Apple's marketing, something immediately identifiable with its products. The feature was introduced alongside iOS 12 and is only available on devices with TrueDepth cameras, namely the iPhone X, XS, and XR, as well as 2018 iPad Pros. Apple Music now has over 50 million subscribers and is believed to be the dominant online streaming service in the U.S. Spotify, though, is well ahead on a global basis, having reported 87 million Premium customers in November, supplemented by yet more people on its free ad-based tier. It recently turned a profit for the first time, and is venturing deeper into podcasts. Does anyone know anyone that actively follows Apple's YouTube channel? If it wasn't for seeing these things on AI I would have no idea they even existed. Side question: are these songs currently nominated for Grammys? Out of the three there was only one that I didn't cringe while listening to. I'm sure that's different for different people and is another reason I couldn't care less about the Grammys/Golden Globes/Academy Awards/etc. Remember, Apple's GUI is based on work by Xerox. Well, the Grammys have been infamously tone-deaf for decades now. The voters often seem to go by sales rather than their own tastes, not to say the latter would produce better results. Remember 90% of technology is based off the work of Apple. Go back to playing with your knockoff iPhone/iPad. Apple cut a deal to use Xerox GUI for Macs. Get over it and sto regurgitating the "Steve stole" meme while ignoring Google/Microsoft/Amazon stealing their successful products from Apple. Apple videos are very popular on YouTube even by those who will do anything to bash them. They eagerly await Apples videos to make a video response about how much they hate Apple for no reason. I want a cowboy hat for *my* memoji. You can. It’s available under “Headwear”, which is the final category to choose from. I don't get this comment. What bearing does this have on anything? Xerox didn't see the potential and Apple licenced it to usher in the computer world we all know, forever changing the landscape. Thank you for sharing the useful thing, I will share with my friends this useful thing!